We love comfort. Do we love peace? That’s the question Ed Flaherty poses. You’ll have seen Flaherty at the downtown Friday Peace Rally, which has been happening nearly weekly for 14 years, recognizable by his shock of white hair, engaging, gregarious manner, and fierce sense of conviction. With other members of Veterans for Peace, Flaherty is working to wake people up to the insanity of war. The U.S. spent $2 trillion in Iraq and Afghanistan, with little good effect, he points out. And the warlike behavior continues. In Yemen, where perhaps the worst humanitarian catastrophe in the world is unfolding, the U.S. provides refueling, intelligence and weapons to the Saudis. In Israel and Palestine, “we’re aiding the total inhumanity,” Flaherty says. And Congress pushes for the new ultra-expensive F-35 plane, which even the Pentagon says we don’t need. Just as dismaying is the fact that violence deeply affects the people who perpetrate it. As a country, we’re doing violence to ourselves. 1968 was a pivotal year. He married his wife, Mary, and attended the Veterans’ March in Washington, D.C. He and Mary became active in politics and peace. In his work life, he taught elementary school and later worked as a banker, mostly with farmers, until his retirement in 2009. Veterans for Peace formed in 1985, responding to the craziness of U.S. policies in Central America. A chapter formed in Iowa in 2010; there are now three chapters here. VFP works to increase awareness of the costs of war; to restrain the government from interfering in other nations; to end the arms race and reduce nuclear weapons; seek justice for veterans and victims of war and abolish war as an instrument of national policy. Flaherty admits frustration at the lack of impact the peace movement is currently having. What, he wonders, could be easier to organize around than Trump’s craziness? He believes people are less outraged now because there’s no draft and wars don’t impact us at home. Plus, the media is silent about our wars. Flaherty and VFP will be striking up conversations with RAGBRAI riders when they pass through town in a few weeks. Writers Group member Andy Douglas is author of "The Curve of the World: Into the Spiritual Heart of Yoga." 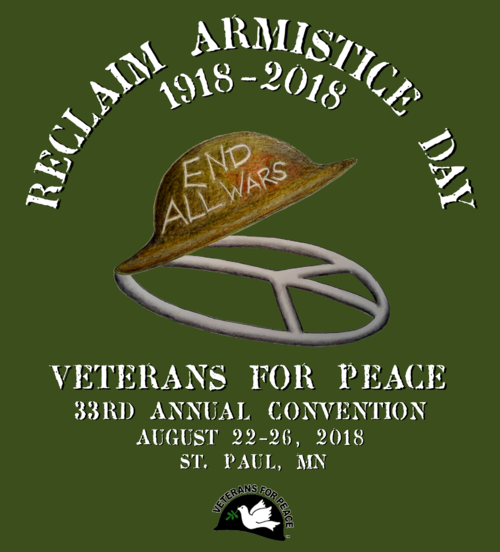 Planning is Underway for Armistice Day 2018! One hundred years ago the world celebrated peace as a universal principle. The first World War had just ended and nations mourning their dead collectively called for an end to all wars. Armistice Day was born and was designated as “a day to be dedicated to the cause of world peace and to be thereafter celebrated." After World War II, the U.S. Congress decided to rebrand November 11 as Veterans Day. Honoring the warrior quickly morphed into honoring the military and glorifying war. Armistice Day was flipped from a day for peace into a day for displays of militarism. The Demilitarize Our Schools group is a community organizing site for activism to intervene in the growing cultural militarism being promoted in our public schools. Please limit postings to information and developments that directly relate to counter-recruitment and school demilitarization organizing.